Whether you're looking for a small thank you gift or holiday office presents, a 12 OZ Milk Chocolate Oreo Cookies - Burgundy Box is the ultimate sweet reward. 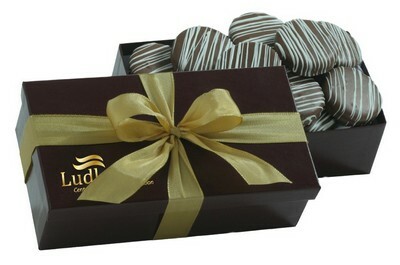 Covered in with rich, creamy milk chocolate and striped with white chocolate. Price includes 1-color logo, hot stamped on box lid. Ribbon colors: as shown. Imprint colors: black, blue, burgundy, gold & silver *imprint area: 2.5" x 1.5"
Sure to please any recipient.